Do you want to improve your WordPress blog? Have you considered customizing WordPress with plugins? One of the biggest advantages of WordPress is the sheer number of easy-to-use plugins that help marketers add functions with little hassle. In this article, you’ll discover 26 WordPress plugins for marketers. Discover 26 WordPress plugins for social media marketers. Plenty of websites have members-only areas or user accounts, or require users to log in to comment. 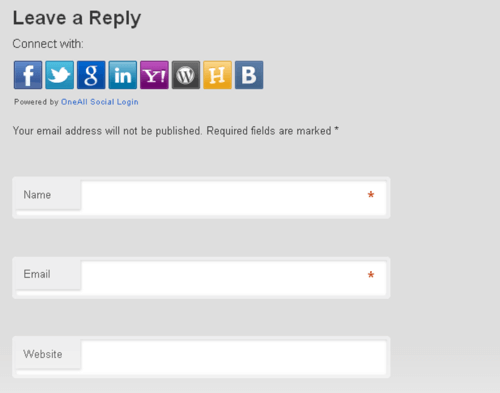 Social Login will let users log into your site with a social media profile. There are more than 30 different networks you can choose to make available for users to log in with, including Amazon, Facebook, Google+, Instagram, WordPress, and more. Social Login is connected to more than 30 platforms that you can choose to let users log in with. Placement options for the login plugin include registration pages, sidebars, comments, and more. This plugin is free to download and use. Snapchat users don’t always actively search for brands on the platform. Because of this, getting followers can sometimes depend on advertising your Snapcode across different online platforms, including your website. The Snapchat Snapcode Widget is exactly what it sounds like; a small widget that allows you to place your Snapcode on your site. All your blog visitors have to do is take a picture of your Snapcode and upload it on Snapchat to find and follow you. Placing your Snapchat QR code on your site can help increase your number of followers, and this widget allows you to add your account name and a title. This plugin is free and easy to use. When you don’t want to choose between featuring your Facebook or Twitter feed, WordPress Social Stream allows you to create a combined feed from multiple social platforms to display on your site. Combining multiple social feeds into one display can show a complete picture of your social engagement. You can add platforms including Facebook, Twitter, Pinterest, YouTube, Dribble, StumbleUpon, LinkedIn, and Delicious. You can pay $19 for a regular license with 6 months of support, and have the option to upgrade to an extended license and/or 12 months of support. One of the most effective ways you can encourage users to share your content and products on Pinterest is to add Pin It buttons to your site, and the Pinterest Pin It Button comes with a range of customizable options. Adding a Pin It button to your content can increase shares and new followers. The plugin will let readers select the image they want to pin from your page, although you can also select an image users will be prompted to choose when pinning. To customize your button, choose from a variety of different colors and sizes and easily place your Pin It buttons anywhere on your blog with a shortcode. You can choose the shape, size, and color of your Pin It buttons. The features above come with the free version of the plugin, but you can upgrade to the pro version for more customization features. Placing a Twitter feed on your blog is a great way to keep your readers up to date and integrate your social media presence with your site. 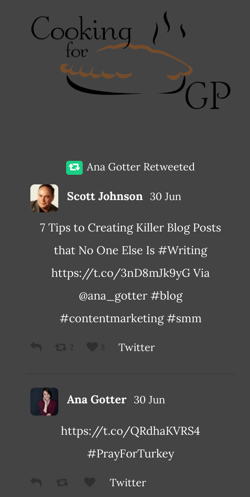 Add Custom Twitter Feeds to your blog to display a customizable feed. You can choose to display only your Twitter feed, a feed from multiple Twitter users, a feed from a single user, or a feed from a hashtag. The top of whichever feed option you choose will display a clickable CTA encouraging users to follow you on Twitter. This Twitter feed is easily customizable and allows you to create the feed your users will most want to see. In addition, the Twitter feed from this plugin is mobile-responsive, automatically takes on the stylistic aspects of your theme, and search engines can find the feed content. This plugin is free and there is a pro version available. The Instagram Feed plugin will display images from your Instagram profile on your site, and help drive traffic to your profile. Placing your Instagram images on your site can increase your followers and engagement. Place Instagram Feed on your site to display photos from non-private Instagram accounts, including yours or those that you’re tagged in, which is great for sharing user-generated content. 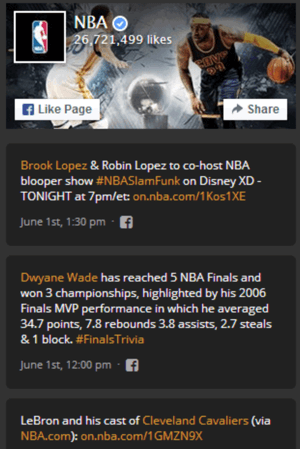 You can have single or multiple feeds, plus it’s mobile-responsive and was updated with the June 1 Instagram updates. Instagram Feed is customizable, allowing you to choose how you want to display your images. This plugin is free and there is a pro version of the plugin available. While some brands post more often on Twitter, some are more active on Facebook. If you’d rather feature your Facebook content, Custom Facebook Feed is for you. Like the Twitter plugin discussed above, you can customize the plugin and the content is search engine–indexed. In addition to broadcasting a customized Facebook feed on your site, you can also place clickable Like Page and Share buttons above it. The free plugin is mobile-responsive and automatically takes on the style of your site, though you can customize it however you see fit to display feeds from multiple pages and/or groups. The WordPress Image Hover Lite plugin is similar to the Pin It button, but you get social sharing buttons for multiple platforms instead of just one. These sharing buttons are displayed across the top of an image when a user hovers over it, making it unobtrusive while encouraging social shares. This plugin provides social sharing prompts when users hover over an image. This plugin is mobile-responsive and compatible with all major browsers, supports eight different platforms, and lets you choose the alignment of the social sharing buttons on the image. The only downside of the plugin is that you have to activate it for each image manually, which can be burdensome for businesses with huge numbers of images. 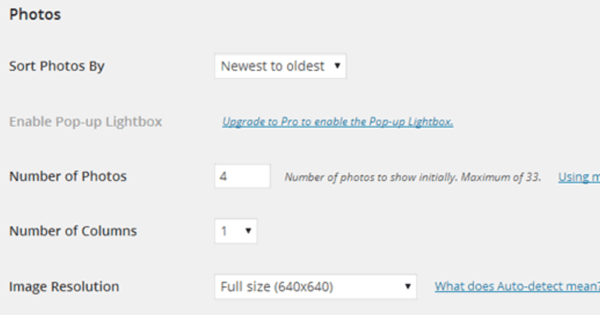 WordPress Image Hover Lite is free and includes the features discussed here, but you can choose to upgrade to the premium version, WordPress Image Hover Showcase, for additional features. The Pinterest Widgets plugin is incredible. 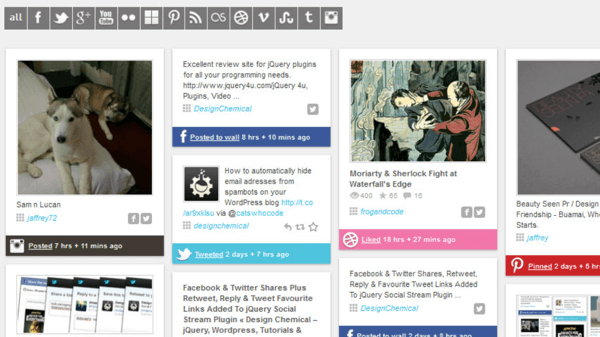 You can place different widgets on your blog to feature different pins or show different Pinterest boards. You can feature up to 30 of your latest pins or boards with this plugin. You can also embed pins on your site and add Follow buttons in place of (or in addition to) the standard Pin It button. The Follow button is one of my favorite features because people don’t have to click through to Pinterest to follow you. You can customize the widgets you’ll place on your site, choosing what size you want the widget and individual images to be. This plugin is free, and while it was last updated a year ago, it’s worked wonderfully for me. 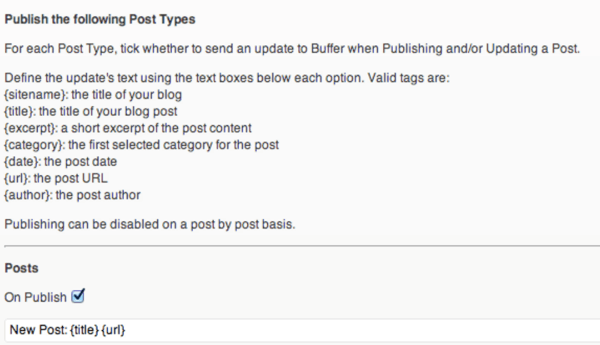 Many businesses use Buffer for effortless content distribution, and the WordPress to Buffer plugin makes it much easier by letting you distribute your latest blog posts to your social media profiles automatically. 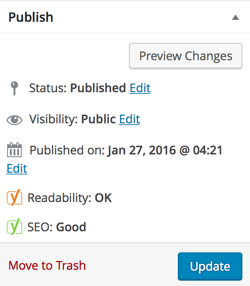 WordPress to Buffer makes content distribution effortless. While the free plugin does all of this, the pro version is worth paying for. It comes with a ton of additional features, including the ability to post pins to your Pinterest board, choose featured images to display on your social media posts, and schedule posts. You can pay $39 for one site, or buy a lifetime license of the pro plugin for $149. Mashable’s MashShare Social Media Share Buttons is an incredible (and free) social sharing plugin that lets you place social share buttons on your content to encourage users to share. One amazing benefit to this plugin is that, unlike a large number of other social share buttons, it doesn’t use the external scripts that often slow down a site’s load times. You can choose which social platforms you want to link to, and can customize the color of the Subscribe button. The plugin lets you decide if you want to display or hide share counts, how often to update the share count, whether you want to disable the share button on certain pages, and more. The MashShare plugin offers more behind-the-scenes customization than any other I’ve seen. This plugin is free and frequently updated. Monarch’s Social Sharing Button plugin lets you choose from different styles of social sharing buttons, including those that appear at the beginning and/or end of a post, automatic pop-ups, and floating social sharing bars. With this plugin, you can choose from a large number of placements for the social share button, including an automated pop-up as pictured above. This plugin is mobile-responsive and you can choose from and customize the button shapes, colors, and hover effects on more than 20 different social networks. You can place social share buttons on individual posts and as a widget in the sidebar or website footer. This plugin is included as part of an Elegant Themes membership & theme package starting at $69 per year, or you can buy lifetime access for $249. Not only do you want users to share your content, you want them to follow you on social media, too. Placing this plugin on your site can increase visitors and the number of followers on your social profiles. The plugin Simple Social Icons will display social icons to take viewers straight to your brand’s social profiles on Facebook, Flickr, Pinterest, Vimeo, Instagram, LinkedIn, and more. You choose which profiles you want to link to and the alignment you’d like. This plugin is free, and easy to use and install. Many people need to make sure their site and their visitors are safe. The Sucuri Security plugin offers basic security monitoring for all WordPress sites. This plugin gives you access to information such as which users are logging in and when. The Sucuri plugin will scan for malware, monitor file integrity, and audit security activity, plus you’ll get notified if the system flags anything as suspicious. You can also find out if your site has shown up as blacklisted from other security software like Norton and allows you to resolve the issue before it adversely impacts your SEO. Sucuri is a free plugin. Google Analytics is an invaluable tool that every business should use, regardless of size or industry. The Google Analytics Dashboard for WP plugin is all you need to quickly and painlessly install the Google Analytics tracking code on your site. Simply install this plugin on WordPress and paste your GA access code where asked. The tracking code is automatically applied to every page of your website. The ability to access some Google Analytics reports from your website’s dashboard can save time. 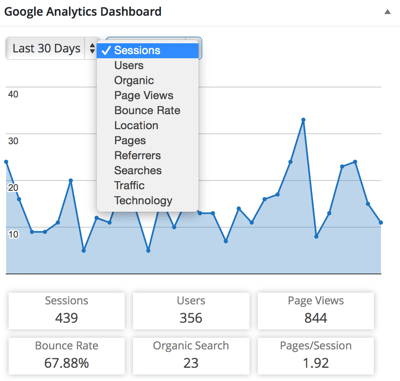 You get access to abbreviated Google Analytics reports on your dashboard, allowing you to quickly see stats on your traffic every time you log into your homepage. Google Analytics Dashboard for WP is a free plugin. If you don’t have automated backups through your hosting company, BackupBuddy will allow you to back up your site and blog regularly. You decide how often you want to back up your site and whether you want to do so manually or automatically, and even select from a variety of locations for your site’s backups to be sent to, including BackupBuddy storage space. 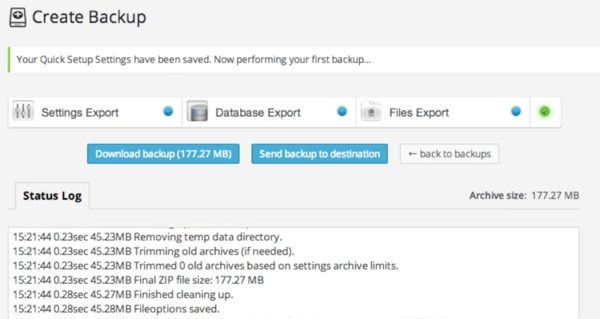 BackupBuddy lets you choose how often you want to create backups and where you want to send them. You’ll also get any backup or error notifications delivered right to your email, so you’ll know right away if something goes wrong. Your backups will be completed online, and you can choose to download backups to your computer or send them to a specific destination, like BackupBuddy’s storage. BackupBuddy is a reliable paid plugin, starting at $80 per year and providing backups for one site and 1GB of storage space, and comes with great support. It’s hard enough to set up your site; keeping it up to date can be just as exhausting. This is true for your theme, too. Theme Check offers a quick solution to ensure that your theme meets the most up-to-date theme review standards and supports the latest WordPress practices. The free plugin runs a few tests to determine if your theme is meeting the current standards, and if there are any errors that need to be corrected, they’ll let you know. If any errors are found within your theme that could be corrected for optimal site function, this plugin will let you know. Note: Theme Check doesn’t check all themes, but it’s a good guide for some of the biggest and most popular themes available. If you struggle with anything even remotely technical, there are some amazing plugins that can help you with the more complicated stuff. The Facebook Conversion Pixel plugin is a great example. 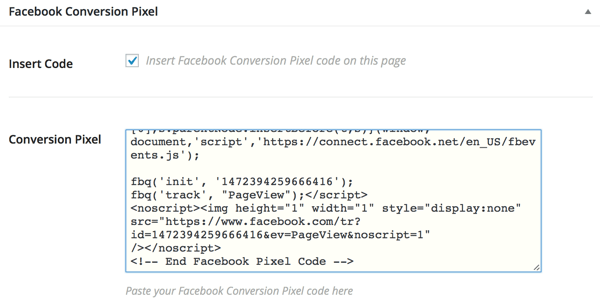 It makes it easy to install the conversion pixel on your site, so you can track your Facebook ads. The plugin lets you choose when you want to apply a tracking pixel to individual pages, and you can place a different pixel on each page if you’d like. Simply copy and paste the pixel code directly into a designated box on the pages where you want to install the plugin. Disqus is a commenting system that comes in an easy-to-install WordPress plugin. It will allow commenters to log in and easily engage in discussions, and get notifications when someone responds or tags them in conversation, so they’ll never miss a response. They can even respond via email. 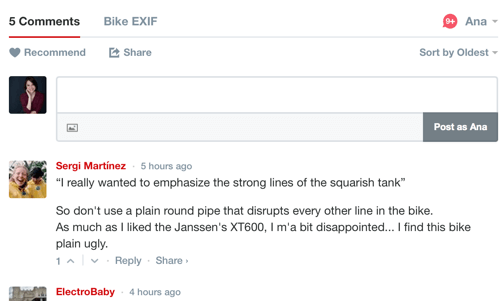 Disqus’s comment system is user-friendly, and the notifications can facilitate conversations instead of just comments. In addition, you get access to valuable features like automatic spam filtering, subscribe options, blacklisting for blocked users, and whitelists. Disqus is a free plugin. Having a comments section full of spam not only robs your site of credibility, it can keep legitimate users from commenting and returning later. Unfortunately, even if you have your settings adjusted so you have to approve all comments, weeding out the spam can take a lot of time. That’s where Akismet comes in. Akismet is an incredibly accurate spam filter; I’ve only ever seen one comment incorrectly flagged as spam out of more than 10,000 spam comments I’ve personally checked. It will store the spam comments filed under a separate spam folder so you can easily clear them out whenever you decide to go through them. Akismet protects your site from spam comments and files them separately to save you time and energy. Akismet will let you know how many spam comments they’ve protected your site from and will let you know if there’s a spam comment in the queue to check on your home dashboard. Akismet is free and easy to use. Whether you’re an SEO expert or you know very little, SEO Yoast will help you designate a keyword to help your post rank better in search engines. SEO Yoast will automatically evaluate the content of your posts and pages for potential SEO performance. 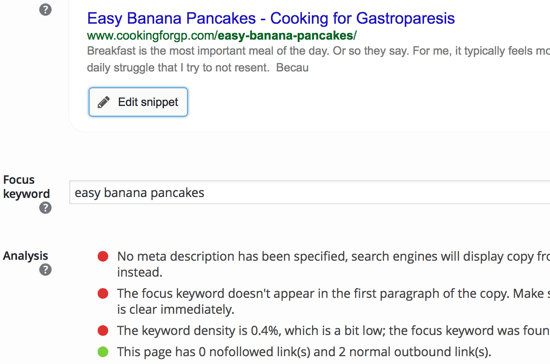 After you set your meta description and the keyword, this plugin also will automatically evaluate how your individual page or post will perform in search based on the designated keyword. In addition, you get detailed information about why your content is going to perform either strongly or weakly, as well tips to correct any weaknesses. SEO Yoast’s analysis provides users with incredible information about how they can potentially boost their performance. 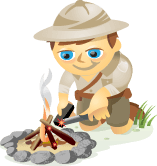 SEO Yoast is free, easy to use, has one-click installation, and is frequently updated. Building an email list is important for both content marketing and social media marketing. The Newsletter Sign-Up plugin lets you place newsletter sign-up boxes on posts, pages, and/or in widget areas such as sidebars. You can also add a “Sign up for our newsletter” opt-in in the comments section of your site or on a site registration form. You can choose to place newsletter sign-up forms on pages, posts, and in a sidebar widget. This particular plugin is compatible with most third-party email services like MailChimp and ConstantContact, and is a free plugin. Changing the widgets that display from one page to the next can be really complicated on a majority of WordPress themes. The Display Widgets plugin simplifies this by allowing you to alter the sidebar based on different pages/posts, categories, and custom taxonomies, with the click of a checkbox. You can manually choose which widgets you want to appear on specific pages. Now you can share the most relevant widgets to users based on the page they’re actively viewing. This plugin is free and user-friendly. If you have events to promote, The Events Calendar is a wildly popular plugin that allows you to display your events on your site. You can quickly schedule events and add information details like venue location. This plugin allows you to share upcoming events with your site’s visitors via a widget. Not only does this free plugin support event search, it can sync with Google Maps. Plus, there are options for a variety of add-on extensions, including those that offer additional features that focus on ticket sales or recurring events. 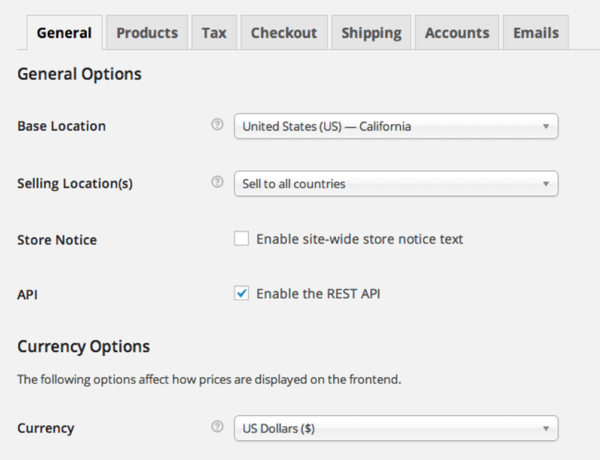 WooCommerce is a great plugin if you sell products from your WordPress site. It was designed to integrate fully with WordPress and makes it easier for you to sell securely to your customers. This plugin gives you the option to choose whom you’re going to sell to and how you’ll sell to them. With the basic plugin, you can sell products, offer product variations, include flat shipping rates, and have automated real-time shipping estimations. It also comes with the ability to accept multiple payment options, including major credit cards, PayPal, bank transfers, and cash on delivery. WooCommerce is easily customizable, allowing you to upload and sell almost any type of product you’d like. While WooCommerce’s basic plugin is free, there are hundreds of free and premium extensions you can use to create and customize an ecommerce solution for your business. WordPress Popup – Popover Maker is a free plugin that lets you create pop-ups that prompt users to take specific actions. There are a variety of behaviors and CTAs you can focus on, and over 20 different triggers that display the pop-up (such as when users visit a page or when they leave it). Even better, you can add a “Never see this again” opt-in that allows users to hide the pop-up in the future, so you won’t risk annoying them every time they click on a new page. You can choose from more than 20 different conditions that will trigger the pop-up to appear. Note: Keep in mind that you can’t have pop-ups on any landing pages that receive Facebook ads traffic, so you’ll need to disable this plugin for those pages. What do you think? Which WordPress plugins do you swear by? Did any of your favorites not make the list? Share your thoughts, knowledge, and experience in the comments below! Tips on 26 WordPress plugins social media marketers can use to improve your blog.